How does cabinet color impact data center lighting? 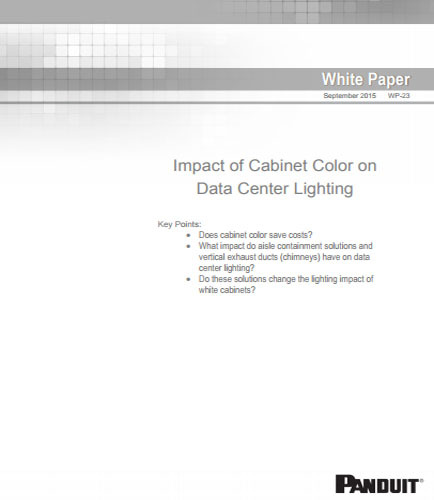 "How does cabinet color impact data center lighting?" The data center industry is going through a change in cabinet color preference for improved aesthetics, work space lighting effectiveness, and cost savings due to decreased lighting requirements. Lighter colors for the cabinets reflect more illumination into the room—increasing the overall lighting level. Fewer light fixtures are needed and resulting in a lower continuous lighting power load. Panduit Corporate Research & Development conducted a series of computer simulations to determine the impact of aisle containment systems and vertical exhaust ducts (chimneys) on lighting in the data center. Analysis such as Baseline Configuration, Cold Aisle Containment, and vertical exhaust ducts (VEDs) are done on black and white cabinets to find its effectiveness on lighting and cooling strategies. What is the use of cabinet color in data centers? What is the impact of data center lighting and cooling strategy on data centers? What is the future of data center configuration? Does cabinet color save costs? What impact do aisle containment solutions and vertical exhaust ducts (chimneys) have on data center lighting? Do these solutions change the lighting impact of white cabinets? “Do more with less” has become the technological mantra, for data centres that have grown both in capacity and capabilities. Two crucial technologies that have surfaced and contributed improvements in both storage and physical-layer devices are Fiber Channel over Ethernet (FCoE) and 10GBASE-T. The use of the two technologies together enhances the modern data centers as it can provide storage, server connectivity, and networking in ways that was not feasible with traditional data center designs. Ethernet technology is continuing to advance with new physical attributes that provide more options for lowering the cost of reliable storage connectivity in the data centers. Move ahead and read the following whitepaper that will address all your queries, including: How does FCoE & 10GBASE-T enhance storage and physical-layer devices? How is FCoE & 10GBASE-T different from traditional LAN and SAN? Is the advancement with server virtualization cost effective for your business? Data centers are the nerve center of successful business operations, resulting in surging demand for processing power, work load virtualization, and consolidation combined with pressure to reduce operating expenses (OpEx) and improve asset utilization. Most modern energy-efficient data centers deploy some kind of containment system— reducing the overall cooling energy cost by preventing or reducing the mixing of cold and hot air streams. Panduit has run several tests focusing on the comparison of common cold air containment and hot air containment techniques: Cold Aisle Containment (CAC), Hot Aisle Containment (HAC), and Vertical Exhaust Duct (VED) or Chimney with the goal to reduce energy consumption in the data centers. What is the importance of maintaining data center cooling energy efficiency? What is the importance of sealing cabinets? What are the selection criteria for Standard Hot Aisle / Cold Aisle (HA/CA) vs. VED vs. CAC? Move ahead and read the following white paper that will address all your questions, including these: What are the types of air containment systems? How to determine ideal data center layout using economic analysis and CFD analysis? How to determine efficiency of cooling system with dry cooler, mechanical chiller and cooling tower? What are the opportunities in air containment systems for data centers?